Passionate about journalism and the yearbook process? Want great long-term income potential? Consider Walsworth Yearbooks, the only American family-owned yearbook publisher. We’re always looking for individuals interested in pursuing a career as a yearbook sales representative. Our sales reps establish and maintain rapport with yearbook advisers, school administrators and students in all types of schools – public and private, elementary to college. The ideal candidate should have a four-year degree, computer literacy, an ability to work independently, be self-motivated and enjoy working in a school environment. Candidates should also possess creativity, an ability to problem solve and an entrepreneurial spirit. If this sounds like you, send us an email, along with your most recent resume to review. Every department at Walsworth Yearbooks is focused on helping our customers, but the sales reps are typically the first Walsworth employee a customer meets. 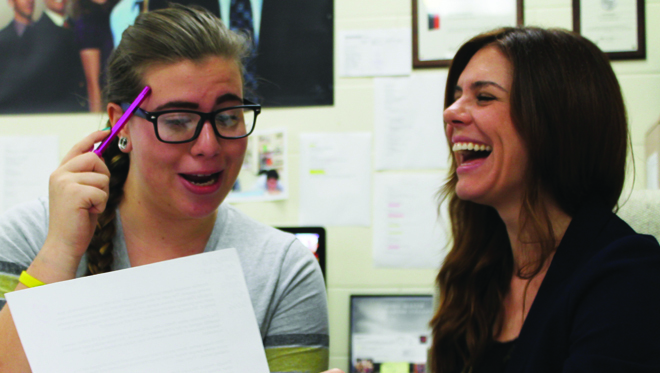 Sales reps spend time at the school, working with the yearbook staff and advisers. Sales reps are there to support customers with all aspects of yearbook: everything from curriculum to training yearbook staff to staying within budget to marketing the book. The sales rep may even go in and teach a class. Sales reps work closely with the yearbook staffs and advisers, and often the school administration, to supply the information and resources needed for a successful year. Sales reps make themselves easy to reach — schools may choose to communicate through text, email, phone call or schedule a time for the sales rep to visit the school. And when the rep isn’t available, they can reach out to their CSR. Chittum works with the training department to coordinate and plan the extensive training that sales reps currently undergo. Walsworth’s sales reps complete about 120 hours of training before they start working with customers. They receive more training after they’ve been on the job for about six months. “You have to kind of get out there and see what the job entails, then come back with really good questions,” said Chittum. Training is ongoing throughout their career, with follow-up and veteran training available. Even Walsworth’s annual meetings – attended by every rep – include training sessions. Walsworth is family-owned and tight-knit, which makes it easier to adapt to customer needs. The personal touch makes a difference, and lets the sales rep play the role of encourager to the adviser and students. Chittum encouraged people with a love of yearbook to consider a career as a sales rep. The job allows for a focus on yearbook, and sales reps get to dabble in a wide variety of skills: technology, graphic design, creativity, business, etc. Chittum had worked on the yearbook staff in high school, but didn’t consider a career in yearbooks until later. She wanted others to know it’s an option.